McDougall Cottage is a traditional granite and limestone labourer’s home located in the City of Cambridge’s historic factory district along the banks of the Grand River. Built in 1858, the cottage now serves as an interpretation centre, hosting a number of Scottish heritage events. Not only is it a gathering place for the community, it is also a place where visitors will learn about Scottish history and traditions in Cambridge, as well as the significance of the Grand River on the Region’s history. 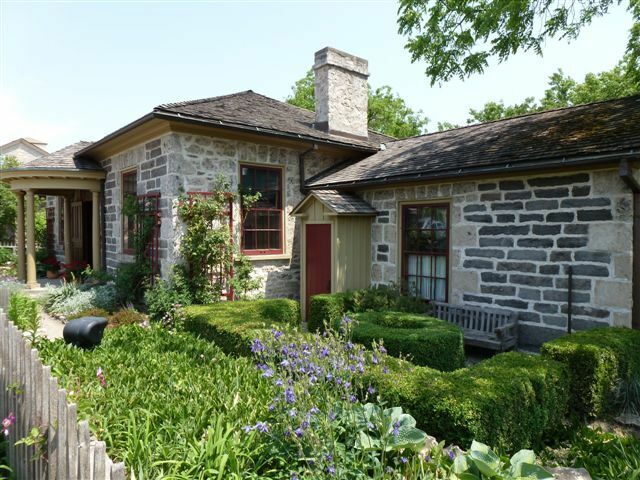 For more than a century, McDougall Cottage was home to the McDougall and Baird families. John McDougall came to Canada with his family in 1853 settling in Cambridge and working as a carpenter and pattern maker until his retirement at age 85. Newlyweds James and Margaret Baird purchased the cottage from the McDougall family in 1901. James was a skilled woodworker and began to renovate and update the home. While the cottage is an example of the Scottish art of stonemasonry, it also features artistic hand-painted friezes and trompe l’oeil ceilings. Visitors will enjoy the cottage’s “wee” garden, which reflects James Baird’s passion for spring flowers and nostalgia for his Scottish homeland. Guided tours of the cottage are available Wednesday to Sunday between noon and 5 p.m.. The cottage plays host to a number of special activities that celebrate the area’s Scottish culture. Monthly events include ceilidhs, Kids in Kilts craft afternoons, Tartan Teas, workshops, lectures, and food demonstrations. The Musician-in-Residence program at McDougall Cottage supports local folk musicians and celebrates Scottish and area music traditions. Throughout the year the folk musician hosts workshops, performs concerts, and presents lectures or demonstrations. Past residencies have included a piper, Celtic guitarist, fiddlers, and the award-winning musical trio NUA.